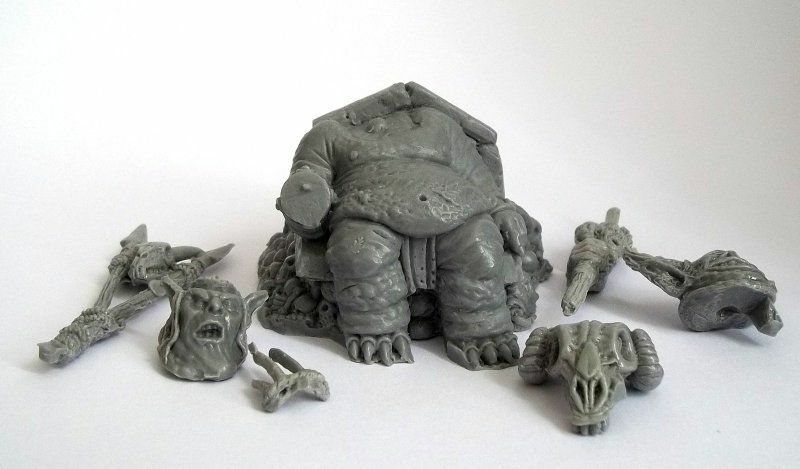 Dark Art Studio is a relatively new (at least to me) company that does a range of 28mm/32mm fantasy miniatures that ranges from goblins to undead, ogres and mercenaries. As stated on their website, Dark-Art-Studios was founded in 2004 by the 5 Townshend brothers headed up by the eldest brother Byron Townshend who does the main sculpting work for the company. The Goblin Chieftain mini itself came in a plastic zipbag. 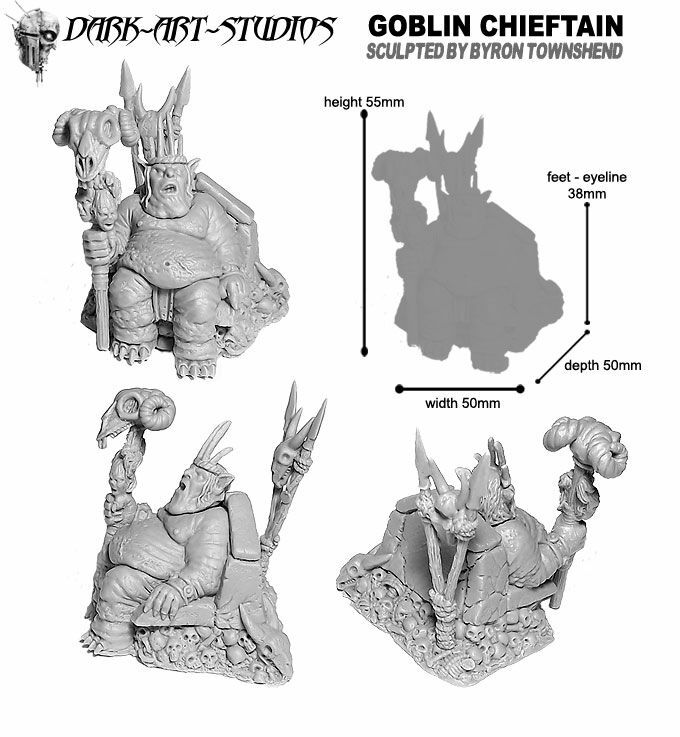 The Dark Art Studio's Goblin Chieftain is a new issue based on the older Ogre Chieftain. 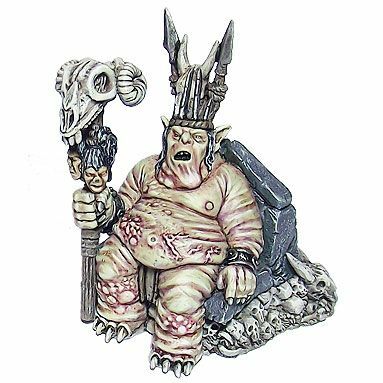 It's a large obese creature seated on his throne that, now post Hobbit the movie, bares strong resemblance not only in name to the infamous Goblin King (only smaller, for those of you who thought of using it for your Hobbit SBG gaming). There is an option for a cyclops head (a monster head with only one eye and a set of horns) which comes at a 2,25GBP added price. I prefer the Cyclops head to the King one. The throne is almost the same as the aforementioned Ogre Chieftain but there are a lot more skulls be it human, goat, or bovine at the foot of it. The boots of the chieftain are replaced by bare feet with what can only be described as claws instead of nails and, unlike the Ogre, the Goblin wears no pants. Otherwise the pose of the body is the same with only minor changes to the skin with added boils on the belly. Even the bracelets on his hands are the same. 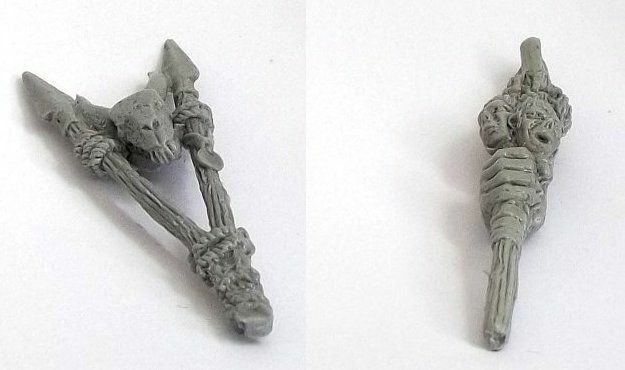 Instead of the sword, this mini holds a staff with mummified heads attached to it (that resemble an old GW bit from their Mordheim or Zombie sprue, if I'm not mistaken). On top of the staff there is place to put the bovine/goat skull. The mini itself comes in 7 pieces. Although there are some mould lines present and almost all the pieces have excess material from casting, the details on this mini are sharp and constant throughout all the bits. Overall, while I liked the original Ogre Chieftain as its cartoony look reminded me of the old Asterix comics that I used to read as a kid, this (Goblin Chieftain) I find to be somewhat lackluster, without idea and sort of bland. Quality: 8 – Lots of mould lines and excess material to be gotten rid off. However, the details are clear and sharp. Assembly: 8,5 – There is need for some greenstuff where the bits join and if you use this mini for gaming, you will definitely need to pin the hand. Value: 3 – 20 GBP is simply way too much for this mini. 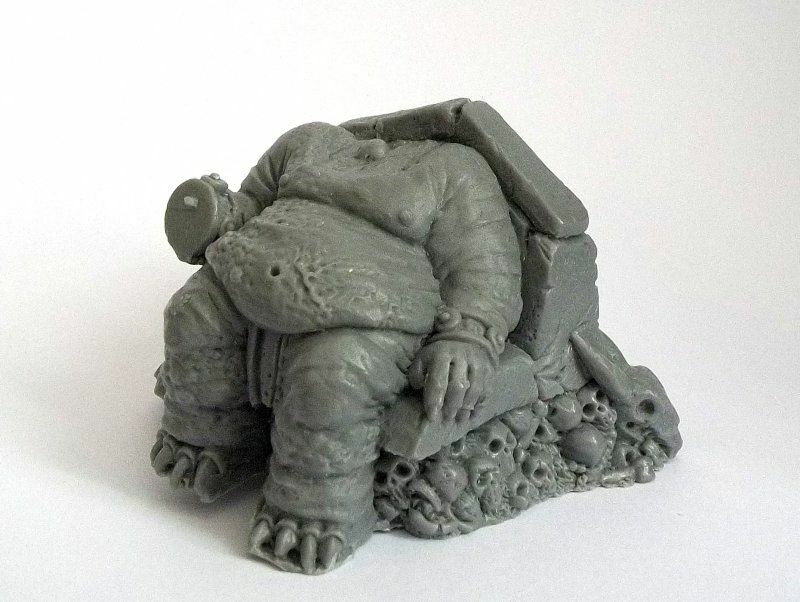 For that kind of cash, one can for instance get any of the Infamy resin miniatures. The idea behind this mini is clearly that it is a character leading, if not your army then at least, one of your units so just knowing there are other minis like it out there reduces its value. With only minimal work done on the original Ogre Chieftain, one might only feel that it would have been a better move to just make an upgrade pack with several bits (like several head and hand options and some boils or pimples to glue) to add to your Ogre Chieftain to transform it. Overall: 6,5 - This mini is an average mini at best, good for wargaming but due to its lack of idea and close resemblance to the Goblin King, not to mention price, I find the rating suitable.